Very rare to find at this price, usually over 2 times this price. Be careful when buying, 750ml is on special offer also for £3. The premium brands they tested that were more than twice the price didn't fare any better so weren't rated for value for money. 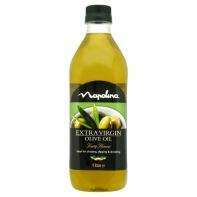 Extra virgin olive oil for £3 a litre is a steal. Thanks. Why wait until everyone else has had their fun with the olives? There is a glut of olive oil at the moment. That link says Napolina is the best, and this post shows where you can get Napolina cheaper than your option. That link says Napolina is the best, and this post shows where you can … That link says Napolina is the best, and this post shows where you can get Napolina cheaper than your option. Not the best source of information on the internet though if the quality of their news reporting is anything to go by. Not the best source of information on the internet though if the quality … Not the best source of information on the internet though if the quality of their news reporting is anything to go by. Tell that to the guy I'm quoting. The source is Which. Due to its use in medieval torture, olive oil always rates very poorly in Witch magazine.